When Brendan Farrell was shopping for a house in Los Angeles, he noticed how real estate sites readily listed a property’s walkability and nearby schools. But the presence of noise—one of the most important quality-of-life factors—remained elusive, and invisible. Farrell realized he could use his skills as an applied mathematician to build a map that could help people “hear” their new homes before they moved in. 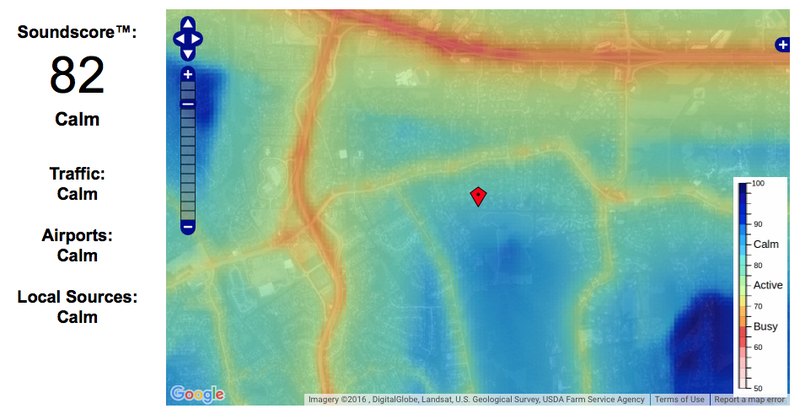 Farrell was teaching at Caltech at the time, and he started working on HowLoud, the first comprehensive, block-by-block tool to measure urban environmental noise. He built a prototype for LA, which we covered in 2015, and set to raising funds to take the maps nationwide, with a brand-new site launching this week. Sound maps exist for most big cities (here’s a customized one for San Francisco) and the Federal Highway Administration has its own system for measuring traffic noise. But Farrell has built an even more sophisticated mathematically based model for sound propagation. After gathering all the data for vehicle traffic, air traffic, and other local sources (like factories, businesses, bars, etc. ), Farrell actually builds a 3D digital model of the city that takes into consideration how sound ricochets over hard urban surfaces. All of this data is crunched to come up with what’s called a Soundscore, and you can search your address to see where it ranks. Scores range from 50 (very loud) to 100 (very quiet). Those differences are incredibly dramatic in a place like LA. In downtown there is cacophony, but as you approach the mountains, the noise disappears into an abyss. Which also highlights the other valuable use of Soundscore: You can use the noise maps to find a quiet spot in an urban area near you. HowLoud’s benefit to home buyers is obvious, so Farrell quit his CalTech gig and is working to get Soundscore listed on real estate sites, alongside the Walkscore that people have already become familiar with. HowLoud is live on several brokerage sites already, as well as some apartment-searching sites. So next time you’re looking to move, you’ll likely see a Soundscore listed right next to the Walkscore—which will undoubtably make apartments near bars tougher to rent.